Travel Advisor Makasar - Pesta Payung "Umbrella Party" 2015, will be held this coming 31 December 2015 to 1 January 2016 (4PM - 10 AM). It will be animated at Samata Goa hill - Makassar (Makassar is the capital city of South Sulawesi), outdoor party. The Pesta Payung is aimed to celebrate new year eve and the wet seasons which come soon this following months. There will be various activity such as special performing from local artist, Makasar stand up comedy, Music party, DJ performance, etc. The Pesta Payung 2015 is produced by Makassar Beerlibur and has been announced within official Indonesian tourism website agenda. It will not only represent Makassar but also Indonesia as general. Makassar well known as kota "angin mamiri" (windy town). It is also called "Ujung Pandang" within old form until 1999. In local language makasar was taken from the words "Mangkasarak" which means the great or noble. Thus, Makasar has many wonderful vacations destinations such as: Losari beach, Fort Rotterdam Fortress with 3 hectares wide, La Galigo museum, Toraja high land, Makasar Trans Studio, National Park Bantimurung, Taka Bonerate underwater park, Malino hill, Bira cape, Tempe Lake, Lejja hotspring pool and shopping paradise at Somba Opu street. Other informations and contact: Twitter: @Mksr_Beerlibur | Path: Makassar Beerlibur | Contact: 081354766610. Couple (2 ppls) IDR. 300K | Include Payung / umbrella, Mantel, Glowing bracelet, Sleeping Bag, Tenda, Free Breakfast, Free Coffee Break. Group (4 ppls) IDR. 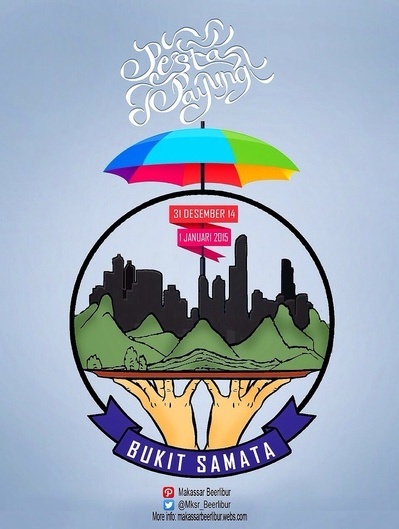 500K | Include Payung / umbrella, Mantel, Glowing bracelet, Sleeping Bag, Tenda, Free Breakfast, Free Coffee Break. Single (1 ppl) IDR. 100K | Include Payung, Glowing bracelet.